(UPDATE) TEPCO released the video from the crane. See my latest post. NHK has an aerial video of Reactor 3 at Fukushima I Nuclear Power Plant, in reporting the incident of a 470-kilogram steel frame (30 centimeters x 20 centimeters x 700 centimeters) dropping into the Spent Fuel Pool on September 22. The link probably won't last (since it's NHK), but here's a screenshot of the video that shows the sides of Reactor 3 building now have platforms on which to put heavy equipment to remove the debris. If the crane failed to grab the steel frame and the frame dropped into the SFP, the whole sequence should have been captured by the video cameras (two on the crane arm, at least two on the platforms). I wonder if TEPCO or Kajima releases the video. 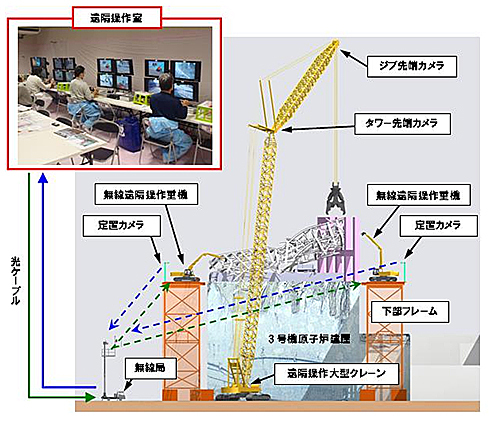 (UPDATE 9/24/2012) TEPCO released the video from the crane. See my latest post. Removal of debris on the operation floor of Reactor 3 at Fukushima I Nuclear Power Plant is being done by remote-controlled heavy equipment on the platforms built outside the reactor building. The system was devised by one of TEPCO's main subcontractor Kajima. TEPCO announced on September 22 that a steel frame weighing about 470 kilograms dropped into the Spent Fuel Pool of Reactor 3 during the debris removal operation of the Reactor 3 building of Fukushima I Nuclear Power Plant which had a hydrogen explosion. So far, there is no major increase in radiation levels nearby, TEPCO says. According to TEPCO, the accident happened at 11:05AM on September 22 when [the crane operator] tried to grab a piece of debris, an H steel lying next to the Spent Fuel Pool on the 5th floor of Reactor 3 building and failed. The H steel slid into the Spent Fuel Pool. A steel beam weighing 470 kilograms shouldn't be very big. But according to this person who called TEPCO's Public Relations to ask about the incident, TEPCO is investigating, because the steel beam could damage the fuel assemblies. Well, it's easy for TEPCO to say. The question is how they are going to do it. Debris removal of Reactor 3 is done by remote control for very good reasons. First, it's such a mess on the operating floor that the workers can't even go there. Second, radiation levels are just too high for the workers to go there. So, how is TEPCO going to investigate? But since it is Saturday in Japan, TEPCO is not scheduling a press conference. Mr. Yukio Edano's constituency is Omiya City in Saitama. People are shouting "EdaNO!" (with accent in NO), "Saikado Hantai" (againt nuke plant restart, a rather tired refrain). It is still a great change as far as Japan is concerned. People no longer feel afraid or silly to march, shouting slogans and beating drums and blowing whistles, and they don't care if they are not a 10,000-strong crowd or 100,000. And unlike in China, no one in the government is telling them to take to the streets (as far as I know). Indians must be thinking they are not Japanese (Fukushima, 2011-to date), just like Japanese were thinking they were not Russians (Chernobyl, 1986), just like Russians were thinking they were not Americans (Three Mile Island, 1979). The Russian-made reactors are the first reactors in India that are capable of generating 1,000 MW. Kudankulam Nuclear Power Plant is located near the very tip of the southern Indian subcontinent. CHENNAI: Loading of uranium fuel in the first unit of the Kudankulam nuclear power plant started on Wednesday, the Vinayaka Chaturthi day, as the controversial project took a major step towards becoming operational. The Atomic Energy Regulatory Board (AERB) had given its final clearance for loading fuel on Tuesday night. "Fuel loading has started and it will take at least 10 days for the process to be completed," said a Nuclear Power Corporation of India Limited (NPCIL) official. Each of the two Russian-made VVER reactors in the plant is capable of generating 1,000MW power. "The nod for loading uranium-235 fuel was given on Tuesday and the plant authorities must have started loading the next day. There is nothing that could have stopped them from loading fuel in the first unit," AERB chief S S Bajaj told TOI from Vienna. The loading process was started without any publicity as per advice from central and state governments. The fuel supplied by Russia was moved to the reactor room by scientists last week. Apart from an AERB team, NPCIL officials and Russian engineers witnessed the crucial event, the last major step before commissioning of the plant. Officials from the International Atomic Energy Agency are likely to visit the plant before the reactor vessel is closed after loading fuel, NPCIL sources said. Once the fuel loading is complete, the AERB will give clearance for closing the reactor vessel and it would take another 10-15 days for the unit to attain criticality, when power generation will start, said an NPCIL official. The unit is likely to be synchronised with the power grid by October-end. Though plant officials are confident of meeting the deadline, there are apprehensions as the Russian reactor is the first of its kind in the country and it may take some more time to fully operationalise the unit. The AERB had given its approval for loading fuel on August 11, but laid stringent conditions to be fulfilled before beginning the process. "After the nod, we also sent a team of officials to give clearance, if required, then and there," said Bajaj. The project, which has faced several problems since being launched, finally cleared the legal hurdles when the Madras high court and later the Supreme Court refused to stop loading of fuel. This is the first time that a nuclear reactor capable of generating 1,000 MW is being operationalised in the country. As of now, the biggest operational reactors in India are the two 540MW reactors at Tarapur in Maharashtra. All other reactors are smaller in size. The Russian abbreviation VVER stands for water-cooled, water-moderated energy reactor. Apart from Russia, China also has similar reactors. A Floating Dock from Japan off the Coast of Hawaii? A local fisherman found what looked like a floating dock off the coast of Hawaii. Japanese characters are reportedly written on part of the structure. The US Coast Guard is cautioning the ships, as the structure may have become adrift after the tsunami on March 11, 2011 earthquake in Japan. A floating menace could be the biggest piece of tsunami debris Hawaii has seen yet. Exclusive Hawaii News Now video shows a floating dock with Japanese writing on it. It was last seen near Molokai. The barge gets your attention and fishermen are concerned it's a hazard however what to do with it remains to be seen. Two Maui fishermen got an up close look at this huge dock. One of them even climbed aboard and saw the Japanese writing. They estimate it's about 30 feet by 50 feet. The dock had pier cleats and electrical boxes attached. The fisherman first saw it Monday night about 30 miles north of Hana, Maui. Then again Tuesday 25 miles northeast of Molokai. And again yesterday when it was about 15 miles north Molokai. Charting the course the fisherman thinks it will hit around Kahuku sometime Friday evening which had Oahu fisherman concerned. "I'd hate to have to be traveling at night and no beacons or nothing on it. And some guys, not everybody has radar and to run into that could be devastating," said George White, Fisherman. "They could seriously damage their boat even at night," said Joey Edwards, Fisherman. Senkaku Islands Row: Japanese Companies in China Hide Their Logos, Display Banners "Diaoyu Islands Are Chinese Territory"
Japan is the perennial loser in a fight with bullies in the sand box. As recent anti-Japan protests turned violent, police and government officials in China advised Japanese companies to display pro-China messages or Chinese flags to avoid becoming targets of the protesters. Now, questions of whether--and to what extent--those companies complied has caused a wave of confusion and anger among consumers in Japan. The protests, which saw Japanese businesses and factories across China attacked, centered on the continuing dispute between the two countries over the uninhabited Senkaku Islands, called Diaoyu by China. Japanese casual clothing store Uniqlo has faced particularly strong outcry over its apparent response to the protests. On Sept. 15, a photo surfaced of one of its outlets in Shanghai displaying a sign which read, "We support the claim that the Diaoyu Islands are inherently China's territory." The sign was posted in the display window of the store's fall fashion line, and remained there for about 40 minutes. According to a company spokesperson, the Shanghai store did not obey instructions by local police to post a pro-China sign for its own safety. The official said the decision was based on company policy that a store "shall not take any political stance or voice opinions on diplomatic matters." However, when anti-Japan demonstrations intensified on the morning of Sept. 15, the store was warned again that its "security would not be guaranteed," prompting the store manager to post the sign at the manager's own discretion, the company official said. The sign was removed at around 12:40 p.m., once the protesters were gone. Uniqlo is saying it did what it did on its own volition, not because the threat from the local police. Wink, wink, you'd understand, right, Japanese consumers who buy our clothes? Don't you want cheap but chic and high-quality clothes made in our Chinese factory? Uniqlo says it has received 1,400 calls and emails from Japanese customers protesting the company's action in China, but the CEO of the company says they were "misquoted". On a separate piece of news from Osaka, washing machines made by the top Chinese maker Haier continue to emit smokes even after the recall and repair. A reactor at Three Mile Island, the site of the nation’s worst nuclear accident, shut down unexpectedly on Thursday afternoon when a coolant pump tripped and steam was released, the Nuclear Regulatory Commission told NBC News. The system tripped when "the pump stopped operating and created a power/flow imbalance," said NRC spokesman Neil Sheehan. The plant responded as designed and is stable with no impact on public health or safety, added NRC spokeswoman Diane Screnci. If any radiation was in the released steam, Screnci said, it would be below detectable levels. Exelon, the plant operator, said in a statement that "during the shutdown, steam was released into the atmosphere, creating a loud noise heard by nearby residents." A NRC inspector based at the plant "responded to the control room immediately after the reactor trip to independently assess control room operators' response to the event and ensure safety systems were functioning as designed," Sheehan said. "He did not identify any immediate concerns with operator or equipment performance." Plant operators were not yet sure what caused the problem. "Once the reactor is sufficiently cooled down, plant personnel will be able to access the containment building and troubleshoot the problem," Sheehan added. Located about 12 miles south of Harrisburg, Pa., Three Mile Island in 1979 saw a partial meltdown of one of its nuclear reactor cores. Small amounts of radiation were released into the environment when the reactor core lost cooling water, exposing the highly radioactive fuel rods. A presidential commission later said the accident was "the result of a series of human, institutional and mechanical failures." Several thousand people claimed they had suffered ill health effects from radiation, but their lawsuit was rejected by a federal court in 1996 with the judge concluding they had not proved their case. Various assessments by the government and nuclear industry have concluded no radiation-related deaths or illnesses resulted from the accident. It's clearly not enough for the power that be in Japan to have peaches grown in one of the more contaminated areas in Fukushima offered to the Imperial Family. Now the government will send the Emperor and the Empress to the areas in Fukushima to observe the decontamination work. Our paper found out from the source in the Imperial Household Agency that the Emperor and the Empress intend to visit Fukushima Prefecture on October 13 in order to observe the work to decontaminate the areas contaminated by the Fukushima I Nuclear Power Plant accident. It will be the first time for the Emperor and the Empress to observe the decontamination work. The Imperial Household Agency is currently scheduling the visit. According to the source, the visit will be a day trip. The Emperor and the Empress visited Miyagi, Iwate, and Fukushima in April and May last year, and expressed deep sympathy to the victims. In the one-year anniversary ceremony this March, the Emperor referred to the nuclear accident by saying "People had to evacuate from areas made dangerous by the nuclear accident, where they had lived and worked for many years. In order for them to go back and live safely there, we have a difficult problem of radiation contamination to overcome." The emperor was the only person among those who spoke in the ceremony who mentioned radiation, who talked to the deceased, and expressed genuine concern for the people who had to leave their homes because of the nuclear accident. I briefly thought of replying, but I quickly dropped the thought. And thank you citizens of Kyoto City for showing us the way back in March, when you shouted down Goshi Hosono and his underlings. Frankly, things like this have never ever happened in Japan before - ordinary people shouting down the leadership of the country. "帰れ、帰れ！　解散しろ！" Go home, go home! Dissolve the Diet and hold election! People shouted at the DPJ leadership candidates speaking atop the van, on September 19, 2012 on the street corner in Shinjuku, Tokyo. According to people who watched the snippet in the evening news in Japan, the television stations all filtered out the angry crowd. As you see at about 2:20 into the video, there is a wide space between the candidates and people. Plain-clothes secret policemen, who look exactly like yakuza, make sure none of the peasants dare approach the van. Well, as you may have heard, the Japanese ambassador to China died before he was dispatched to China. So instead, Chinese protesters seem to have picked on the ambassador of Japan's overlord (as many in Japan perceive the US to be). US Ambassador Gary Locke is ethnic Chinese (3rd-generation). Somewhat like the Japanese shops and restaurants destroyed by the mob in various parts of China are owned and operated by Chinese. BEIJING—The U.S. ambassador to China, Gary Locke, was surrounded in his official car by a group of about 50 Chinese protesters outside the U.S. Embassy on Tuesday and had to be protected by Chinese security guards, a State Department spokesperson said. The protesters caused minor damage to the vehicle, but Mr. Locke was unharmed, the spokesperson said in a statement. "Embassy officials have registered their concern regarding today's incident with the Chinese Ministry of Foreign Affairs, and urged the Chinese Government to do everything possible to protect American facilities and personnel," the statement said. The ministry couldn't immediately be reached for comment. The U.S. Embassy in Beijing is close to the Japanese Embassy, where thousands of protesters have been massing over the past several days in a show of anger over the Japanese government's decision to purchase disputed islands in the East China Sea. Security near the U.S. Embassy was heightened this week, as riot police and others attempted to keep order among protesters. Main roads near the embassy had been closed to vehicle traffic, though they were reopened early Wednesday amid a heavy police presence. The incident comes as U.S. Defense Secretary Leon Panetta is in Beijing this week meeting with senior Chinese military and civilian leaders. The statement gave no details about the demonstrators who blocked Mr. Locke's car, and what motivated their action. Protests in some cities have turned violent, with Japanese cars smashed and Japanese-owned shops and factories forced to close. Nonetheless, protests in Beijing haven't appeared directly targeted at the U.S., or its alliance with Tokyo. "Chinese security personnel standing in front of the embassy responded and removed the demonstrators from the scene, allowing the Ambassador's vehicle to enter the Embassy compound through another gate," the statement said. Mr. Locke, the first ethnic Chinese to hold the job of ambassador to China, has become a media celebrity since he arrived in 2011. Many Chinese admire his informal style, and how he and his family mix with ordinary Chinese, in contrast to the aloof behavior of their own leaders. Mr. Locke was famously photographed by a Chinese traveler carrying a backpack and buying his own cup of coffee at Starbucks at Seattle airport as he flew off to start his assignment in Beijing. The picture went viral on the Chinese Internet, where critics noted a Chinese official would likely be surrounded by personal assistants. So, the policy about zero nuclear plants operating in Japan by 2030 first became the policy about zero nuclear plants operating in Japan by some time in 2030s, and then the wording was completely dropped from the official cabinet decision document. Now, what is in the cabinet decision? The Japanese government is committed to the "unremitting (ceaseless) examination and revision" of the new energy policy. Zero nuke is not explicitly written in the cabinet decision document, the new energy strategy "unremitting revision"
The government [Noda administration] made the decision to "execute the future energy policy with unremitting examination and revision, based on the "revolutionary [innovative, if you so prefer] energy and environmental strategy"" during the cabinet meeting on September 19. The strategy is supposed to aim at zero nuclear power plant operating in 2030s, but "zero nuclear" was not mentioned in the official document of the cabinet decision. Chief Cabinet Secretary Osamu Fujimura said in the morning press conference, "We will plan for concrete actions for the energy and environmental policies based on the strategy." Minister of Economy, Trade and Industry Yukio Edano said in the press conference after the cabinet meeting, "(The strategy) is not mentioned in the document for the cabinet decision, but was authorized in the cabinet meeting." Minister in charge of national strategy Motohisa Furukawa said, "There is no hidden agenda behind the way we made our decision." The body text of the Nuclear Energy Policy Guideline compiled in 2005, for example, was not the subject of the cabinet decision either. The business circle and others were strongly against the strategy that was agreed on by the "Energy and Environmental Conference" of the Cabinet Office on September 14. In the National Strategy Conference held on September 18, civilian members expressed opposition, and the approval of the strategy didn't happen. There is no hidden agenda behind the way they decided. Now that's unintentionally funny. Jiji Tsushin is kind enough to make excuse for the minister by citing the precedent, as if that would make it OK to omit the "zero nuke" reference from the formal cabinet decision, after the unprecedented 90,000 public comments on the nuclear energy policy flooded the office of Mr. Furukawa. The omission is called "plausible deniability". Twenty years from now when all these politicians have long gone to the politicians' heaven or into the cushy retirement, no one will care to know how the decision was made, except by looking at what was written down on paper. Since no mention of "zero nuclear plants in 2030 or 2030s" is found in the document, there will be no reason for the administration at that time (if Japan lasts that long as a nation, given the Chinese threat of dumping Japanese bonds) to make that happen. Oops. Ms. Merkel should have waited one more day. Vienna, Sept. 17 (Jiji Press)--German Chancellor Angela Merkel welcomed on Monday a new strategy of the Japanese government to lower dependence on nuclear power to zero in the 2030s. Merkel said at a news conference in Berlin that she expresses respect for Japan's decision and that she hopes the two nations will strengthen cooperation in converting to renewable energy sources. Since the nuclear accident in March 2011 at Tokyo Electric Power Co.'s <9501> Fukushima No. 1 power plant, Germany has worked closely with Japan on energy policy, Merkel said. She said Germany is pleased to continue cooperation with Japan and that Japan must be looking for stronger cooperation. The chancellor said Germany hopes to share information with Japan on energy efficiency, the introduction of renewable energy and the expansion of power grids. In the press conference after the cabinet meeting on September 19, Yukio Edano, Minister of Economy, Trade and Industry said that the new energy and environmental strategy that aims at zero nuclear power plant operating in 2030s "is not mentioned in the document for the cabinet decision, but it was authorized in the cabinet meeting." Yoshihisa Furukawa, minister in charge of national strategy, said that the cabinet decision on the new energy strategy had been put off. So, with the Keidanren's chairman threatening to resign from the national strategy council over the zero nuke policy and IAEA expressing doubts about the implication of zero nuke on the production of plutonium, the Noda administration simply drops the zero nuke strategy which they embraced reluctantly anyway to win popularity in the coming Lower House election. And guess what. Prime Minister Yoshihiko Noda is expected to win the Democratic Party of Japan's leadership election in a landslide. Uh oh...now we're talking serious matters. Are Messrs Ishihara, Noda (not to mention Bank of Japan Governor Shirakawa) ready for this? Not needing further explanation is the reality that should China commence a wholesale Japanese bond dump, it may well lead to that long anticipated Japanese bond market collapse, as creditor after creditor proceeds to sell into a market in which the BOJ is the buyer of only resort in the best case, and into a bidless market in the worst. The immediate outcome would be soaring inflation as the BOJ is forced to monetize debt for dear life, buying up first hundreds of billions, then trillions in the secondary market to avoid a complete rout, matched by trillions of reserves created out of thin air which may or may not be halted by the Japanese deflationary gate, and which most certainly could waterfall into the economy especially if Japanese citizens take this as an all clear signal that the Japanese economy is about to be crippled in all out economic warfare with the most dangerous such opponent, and one which just defected from the "global insolvent creditor" game of Mutual Assured Destruction. Further complicating things is that Japan has no clear means of retaliation: it owns no Chinese bonds of its own it can dump as a containment measure. Instead, Japan is at best left with the threat of damages incurred on the Chinese economy should Japan be lost as a trading parting. One thing here is certain: Japan picked on the wrong country when two weeks ago it "purchased" the disputed Senkaku Islands. If it thought that China would just forgive and forget with a wink, it was dead wrong. It now has several two options: undo all that has happened in the past fortnight, in the process suffering tremendous diplomatic humiliation, leaving Senkaku in the "no man's land" where they belong, or push on, and suffer the consequences. And the consequences for the country represented by the question market in the chart below, would be tragically severe, as would they for the entire "developed", insolvent and daisy-chained world. The world could literally collapse over some inconsequential pieces of rock in the South China Sea. Kitakyushu City Started Radioactive Disaster Debris Burning and Burying, Also Started Internet Monitoring to Prevent "Baseless Rumors"
"Wag the dog" is working splendidly in Japan, as the media focus is solely on the small piece of real estate in the ocean (plus natural resources under the ocean, amount of which seems nowhere near the initial estimate, by the way). As they start the burn of disaster debris from Miyagi Prefecture in Kitakyushu City, first ever of such a burn west of Shizuoka Prefecture (which is located about the middle of the archipelago), only a smattering of newspapers cover the event, and none of them mentions continued strong opposition by residents in the city (and far greater number of Japanese citizens/residents outside the city), and local fishermen (the ashes are to be quickly buried in the landfill in the bay). Anonymous city official is quoted as basically saying "Maybe we shouldn't be doing this, but it was the national government's responsibility to tell us otherwise." As I wrote in my previous post, there is no sensible reason to bring the debris all the way to Kyushu and burn it, because, for one, there is no debris technically that could be diverted to Kitakyushu City. The task of the city from now on is to dispel fears among the residents over the debris burning. The city will publish the data on air radiation levels near the three incineration plants on the city's homepage, and since September 17 it has been monitoring the Internet for messages as the countermeasure against baseless rumors. The city has contracted a private business, who will check the Internet message boards. The purpose is to see whether there are baseless messages that may lead to rumors that may damage tourism and agriculture and fishing industries [in Kitakyushu City]. However, it hasn't been decided at this point how to respond to such a message, if found. After the incineration on September 17, the city measured the air radiation levels on the perimeters of the three incineration plants; the levels were between 0.05 to 0.09 microsievert/hour, unchanged from before the incineration. Based on these measurements, the city says "There is no problem with the safety", and will start burying the ashes in the landfill in the city's Wakamatsu-ku. However, some doubt the necessity of wide-area disposal of disaster debris. Miyagi Prefecture has stopped requesting for the acceptance of the flammable debris [that's what Kitakyushu is getting] because the prefecture can now do it on its own, and there are hardly any municipalities following Kitakyushu City [in accepting the debris]. Also, the processing cost is about 77,000 yen per tonne, higher than the cost suggested by the Ministry of the Environment (30,000 to 70,000 yen). People who oppose [the wide-area disposal] ask, "What's the point of spending that kind of money to do the wide-area disposal?" The Ministry of the Environment, who requested the cooperation from all municipalities in Japan, now explains, "The sooner the debris disposal is done the better, and at the time of our request we thought it was necessary (to ask all municipalities in Japan)." The senior officials in Kitakyushu City now says, "It may have been better if the national government had exerted a little bit more control [over the issue of wide-area disposal]." Besides, what the Ministry of the Environment is not telling you is this: At the time when the Ministry decided to spread the debris all over Japan, they weren't aware that the debris were contaminated with radioactive materials from Fukushima I Nuclear Power Plant. It apparently never occurred to them, and they went ahead with the plan of wide-area disposal, which had been in place long before the disaster happened. Looking at the debris, the concern should be more about chemical and heavy metal contamination (from tsunami) and asbestos. But then, the severe environmental pollution from these substances is what Kitakyushu City has been subjected to and familiar with, ever since the first furnace was built and installed in the city in the late 19th century by the central government. After a year and half since the start of the nuclear accident, only the bureaucrats and officials in national and municipal governments who still think they can measure the radiation contamination by waving a survey meter over the debris (or food, for that matter). I still see occasional, exasperated tweets from the radiation researchers in the universities that their job would be so much easier if a survey meter could tell them the density of radioactive materials in any given item. According to Kokura Times, the city is paying the private company 12 million yen (US$152,000) to monitor the Internet message boards and report back to the city of the findings. I suppose the city's mayor who bullied the opposition will send the invoice to Goshi Hosono, who will promptly pay with the taxpayers' money. Senkaku Islands Row: 2 Japanese Landed on One of the Islands? According to the information obtained by the Maritime Safety Agency, two people considered to be Japanese landed on Uotsurishima Island in Senkaku Island, Okinawa at about 9:30AM on September 18. The Agency is trying to verify the information. I hope it's Shintaro Ishihara and his son, and I hope they will stay there for good. (UPDATE) According to Nikkei Shinbun (9/17/2012), the Noda administration is dispatching the Self Defense Force ships to Senkaku Island. Not to be late for the party of global unrest from Portugal to Syria to Afganistan to Indonesia, about 12,000 fishing boats have departed from mainland China, and 1,000 of them due at Senkaku Islands on September 18. Young males in 20s, at most early 30s, smashing windows of Seibu Department Store in Shenzhen. China's draconian one-child policy has produced a severe, unnatural imbalance of males and females, 1.2 to 1. As the economy slows significantly in China, how to engage these excess males in gainful activities becomes a big issue. What better way than to egg them on to some destructive activities to relieve some pressure? I thought this photo below was cute. A middle-aged man posing in front of a huge banner at a fake-brand goods market in Beijing, saying "We refuse to sell Japanese goods, the islands are ours!" Uh... fake Japanese goods made in China? Take a close look at the depiction of Senkaku Islands, with figures (soldiers, probably) propping up a Chinese flag. The US Marines in Iojima imagery. Very cute. By making the banner in Chinese and English (not Japanese), it's rather obvious who they are appealing to. Techworld: "Microsoft discovers Chinese malware pre-installed on new PCs"
In ‘Operation B70’ started in August 2011, Microsoft documents how its Digital Crimes Unit (DCU) bought 20 brand new laptops and desktop PCs from various cities in China, finding that four were infected with pre-installed backdoor malware, including one with a known rootkit called ‘Nitol’. Tracing Nitol’s activity back to an extensive network of global command and control (C&C) servers, the team discovered that the malware that has infected PCs to build a larger bot, most probably used to launch DDoS attacks. Disturbingly, other malware hosted on the main domain used as C&C by Nitol was capable of performing just about every nasty in the malware criminal’s armoury, including keylogging, controlling webcams, and changing search settings. “What’s especially disturbing is that the counterfeit software embedded with malware could have entered the chain at any point as a computer travels among companies that transport and resell the computer,” Microsoft said in a blog introducing its investigations. Anyone installing malware during manufacture – that is before any form of security is added – would have an important head start over security systems that might be installed on the PC at a later point. The only way around this would be for the customer to reinstall the operating system after purchase using a known secure image. (UPDATE) Kitakyushu City is burning it now, on Monday September 17, which is a holiday in Japan (Respect the Elderly Day, no joke). Looking at TV Tokyo News, it certainly does not look anything like "wood chips". Does that make sense? Yes it does. Kajima, one of the largest general contractors in Japan, got the job of transporting the debris by sea for a handsome 2 billion yen (US$25.5 million), and the mayor of Kitakyushu City can tell the residents that the cash-strapped city of his will get 620 million yen from Miyagi Prefecture (who will bill the national government, who will bill the Japanese citizens/residents), according to Mr. Yushi Yokota, Communist Party assemblyman in the Miyagi prefectural assembly. After all, Kitakyushu City has been prepping the city's children, telling them how wonderfully safe and clean it is to burn the debris. This kind of effort should not be wasted. 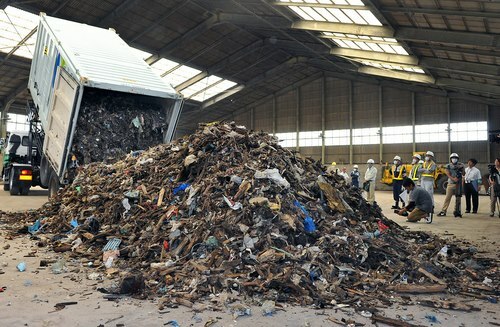 The containers carried flammable debris, mostly wood chips carefully sorted and washed, from Ishinomaki City in Miyagi, or that's how it was sold to the Kitakyushu City residents. Well, not quite. A blog called "Kyushu Sunflower Project" by people against accepting and burning debris in kitakyushu City has this photo in one of their posts. When one of the containers was opened, this is what they found. Does it look like "wood chips" to you? Does it look like they were carefully sorted and washed to you? There is also an allegation of "double-counting" of disaster debris from Ishinomaki. As it turns out that there is far less debris than originally estimated, there is not enough to go around. So what does the enterprising governor of Miyagi do? Double-count. Kajima's joint venture had won the contract to process all the disaster debris in Ishinomaki last year. That should have been the end of it. No debris to give to anyone else. But miraculously, for Kitakyushu City, the debris somehow materialized, and Goshi Hosono's Ministry of the Environment will make sure it will get burned and money be paid to Kajima and Kitakyushu City. 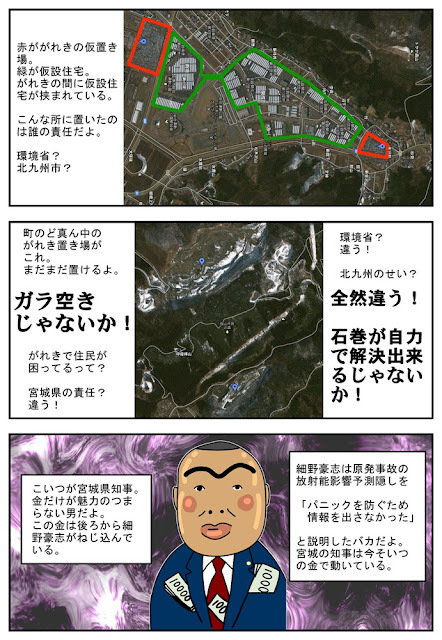 The blog "Kyushu Sunflower Project" has a cartoon titled "There was no debris left", explaining this double-counting. 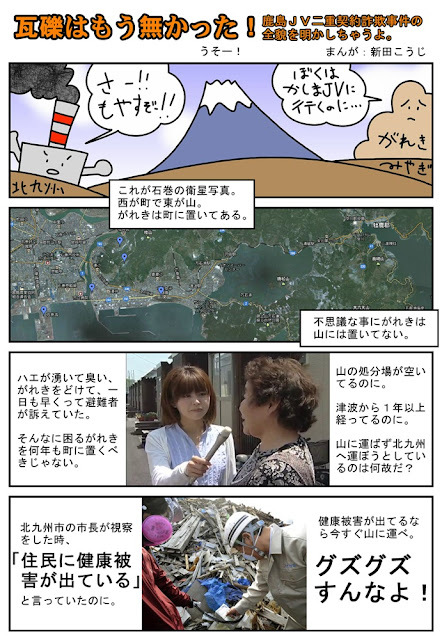 The cartoon also has an incredible piece of information - the temporary housing for people in the city who lost their homes in the tsunami of March 11, 2011 was built right next to the debris piles. What's more, Ishinomaki City does have a landfill in the mountain on the east side of the city, and it is empty.